If you are johns_dunwerken , click the Continue button to pay now. 2004 Topps Wacky Package Original Sticker Card Art! Gooya. This parody image was intended for the 2004 Topps Series 1 Wacky Packages sticker set. For whatever reason, this title was scrapped and later replaced in the checklist with another title. 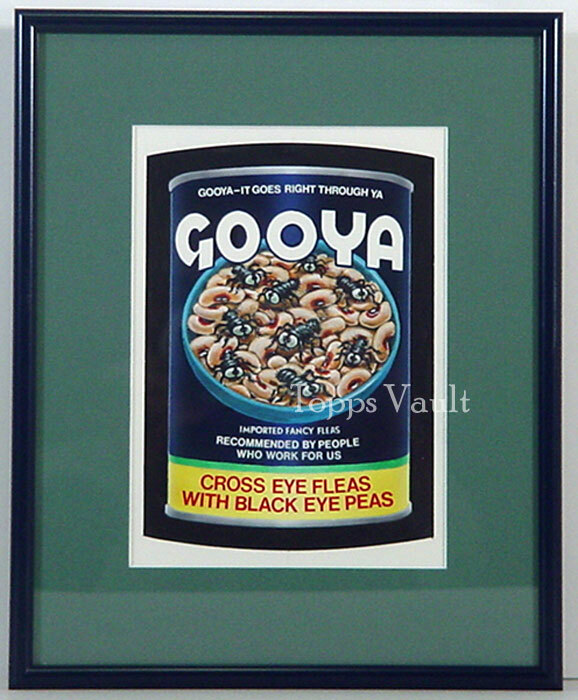 Topps commissioned artist Tom Bunk to create this squirmy rendition of the Goya black-eye peas can. Art board measures (5" X 7") in size and is in excellent condition. This original work comes professionally matted and framed (8 1/2" X 10 1/2") with your immediate viewing pleasure in mind. Chances are, this version of the Goya can of peas, will not appear on a Wacky sticker any time soon. With its crisp color and sharp detail, this stunning work is a must for the avid Wacky fan! All Topps Vault auction lots come with a certificate of authenticity. Collectors, please visit our other special Wacky Packages auctions on ebay today!